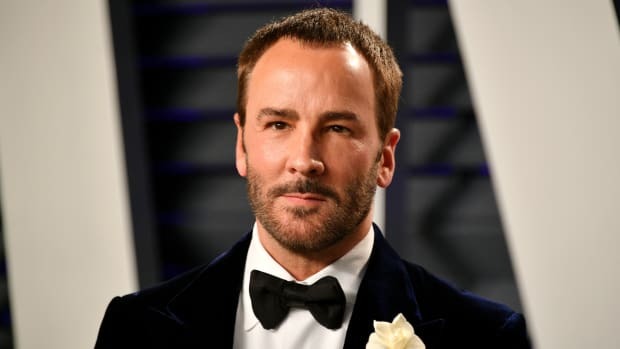 The Council of Fashion Designers of America (CFDA) has officially elected Tom Ford to be its chairman, effective January 1, 2020. Ford is the 11th designer to hold the position, succeeding Diane von Furstenberg most recently, who held it for 13 years. Before her, the gig — which was upgraded from president to chairperson under von Fursternberg in 2015 — was held by big names like Oscar de la Renta, Stan Herman and Bill Blass. The CFDA board, which is made up of about 23 people and includes designers such as Reed Krakoff, Michael Kors and Tommy Hilifiger, voted on the new chairman on Tuesday during a meeting that focused on preparation for the upcoming CFDA Fashion Awards Gala. Ford, who has been a member of the CFDA since 2000, has won a total of seven CFDA Fashion Awards: Menswear Designer of the Year (2015, 2008), Womenswear Designer of the Year (2001), Accessory Designer of the Year (2002), Board of Director&apos;s Tribute (2004), International Designer of the Year (1995), and the Geoffrey Beene Lifetime Achievement Award (2014). He is based full-time in Los Angeles — an interesting fact considering how instrumental the CFDA is in the development of New York Fashion Week — and has shown his collections in several fashion capitals including New York, London and Milan. However, WWD recently speculated that Ford has purchased the former Halston mansion on the Upper East Side, perhaps meaning that he could be planning to spend more time in the city moving forward. "Having lived and worked in each of the global fashion capitals of the world, I look forward to working with the Board of Directors to further the voice of American Fashion and its designers," Ford said in a press release. "As the Chairman, I look forward to continuing the incredible work Diane has done over the last 13 years. Diane is a true force and her contribution to the CFDA and to American fashion is immeasurable. We all owe her a great deal." For her part, von Furstenberg expressed excitement at the prospect of Ford taking over as chairman. "American Fashion could not wish for a better visionary to further grow its impact in the global landscape," she said in the press release. "Tom is a role model for all of us, and we are very lucky to have him as the next Chairman of the CFDA." The CFDA has over 500 members made of up designers from women&apos;s and men&apos;s wear, jewelry, and accessories. In addition to hosting the CFDA Fashion Awards Gala, the council manages the official New York Fashion Week schedule and is the owner of the Fashion Calendar.